Chickpeas are such a healthy, delicious food! I’m always looking for ways to add a few extra chickpeas to our diet. In fact, I’ve been known to snack on them plain, or sprinkled with salt and balsamic vinegar. That’s where I got the idea for Chickpea Salad with Tomatoes and Feta…a medley of chickpeas, red onion, tomato, cucumber, avocado, and fresh basil sprinkled with organic feta cheese and tossed with creamy balsamic vinegar dressing. It’s fresh, filling, and easy to make! You could serve this salad as a side dish, or it could easily be the main course. A great way to enjoy the benefits of chickpeas! Start out with organic chickpeas, canned or home cooked from dried beans. Chop a few tomatoes (ours are the first from our garden!) and some red onion, then add a chopped avocado and snip in some fresh basil. A sprinkle of organic feta cheese is stirred in just before serving. I wanted a balsamic vinegar dressing for this salad, but it needed to be something a little more substantial than oil-and-vinegar. A quick internet search turned up this great dressing recipe at Cupcakes and Kale Chips! Greek yogurt gives the dressing its creamy texture, along with balsamic vinegar, Dijon or stone ground mustard, olive oil and honey. Toss it all into a jar and shake it up…so easy! It turned out to be a great way to turn a simple snack of chickpeas and vinegar into a whole meal. You could even toss some grilled chicken in with the salad to round it out! 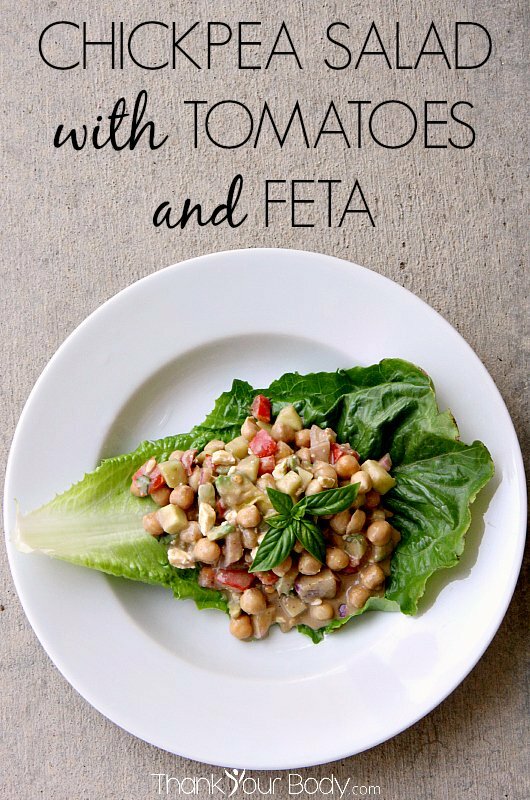 Chickpeas are such a healthy, delicious food - this chickpea salad with tomatoes and feta is a refreshing and flavor salad. In a large bowl, combine the chickpeas, cucumber, tomatoes, avocado, onion and basil. Stir well. Put all the ingredients for the dressing into a jar and shake it up, or whisk them together in a bowl. Drizzle the dressing over the salad and toss well, making sure the dressing covers all of the beans and vegetables. Add the feta cheese and gently stir to incorporate. What’s your favorite way to eat chickpeas?